Yep, we have expectations and lucky for us, festivals are listening. There are now times when we find that, alongside the music, food can also be headlining the festival too. Well Rachael, your wish is our command!  We are super pleased to announce his return for 2019! Hurrah! 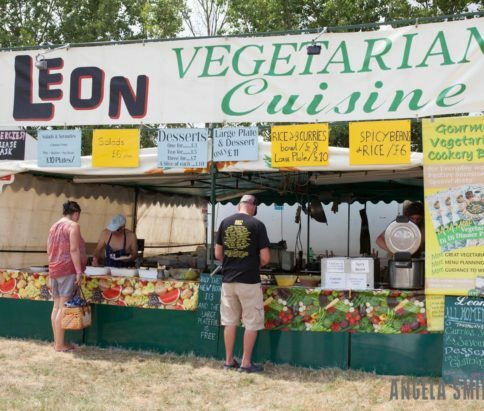 For over 35 years, LEON has been credited with bringing scrumptious vegetarian food to festivals. 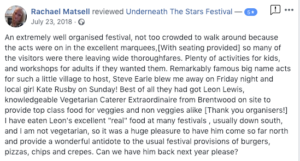 Leon Lewis gave up his job as a Mathematics teacher at Brentwood School, Essex to become a vegetarian caterer in 1980 with an aim to impress as many taste buds as possible with his international gourmet vegetarian delights. 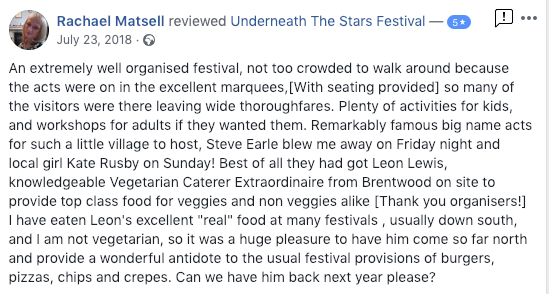 Using healthy ingredients such as handpicked wild food, fresh fruit, vegetables and high quality wholefoods, Leon has consistently provided mouth watering food for thousands of people each year at festivals. Awwww we love the last one Leon. Thanks for those. All the food Leon sells is homemade. He uses a lot of wild food such as nettles, samphire, mushrooms, vine leaves, wild garlic and fruit from the hedgerows. Don’t think you will be left hungry, the plates to which Leon serves his tasty food on are ten inches wide!!!! This means a whole lot of delicious grub! The main thing we love about Leon (apart from his food) is his wonderfully friendly nature. He is such a lovely person with an incredible passion for food. Mix this with his expertise and professionalism and it is the perfect blend for success. 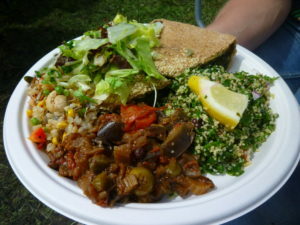 So, please visit Leon at our festival or at any other festival he will be serving this year – see here.